Teeth Whitening - Cost & Types. Are you looking for a trained, certified and licensed Plantation dentist for teeth whitening cosmetic procedure? Sit back in the dentist's chair while a solution containing 35 % hydrogen peroxide (active ingredient) is applied to your teeth and activated by a high-intensity light to accelerate the tooth whitening process. Our top-rated specialized laser teeth whitening has been proven to be safe. The whitening laser appointment last approximately one hour. While the vast majority of general and cosmetic dentists perform teeth whitening with a whitening gel only, we specialize in laser dentistry. Our dentist are certified and license in laser dental procedures. We have pioneer removing long-term stains from the teeth enamel surface with our waterlaseMD and waterlase iPlus lasers. When we met our patients in real life, we try to unearth their dental and life story, and to tell our own as clinicians. The end goal is find out if we can bring these patients back to a whiter smile. In this process of knowing each other during our first consultation we tap into the underlying reason patients have severy stained brown and yellow teeth and why they have decided to come to see us– to get to be the best version of themselves; a version they have always had within them that got lost along the way. It is important to remember when selecting a whitener product, be sure to look for the American Dental Association, ADA, Seal of Acceptance - your assurance that they have met ADA standards of safety and effectiveness. Teeth whitening, also known as tooth bleaching, is a common procedure for consumers in Plantation and Fort Lauderdale dental offices but especially in cosmetic dental offices. Your smile is important. It's one of the first things you notice when you meet someone. A whiter, brighter smile is beautiful. Everybody loves a bright white smile, and there are a variety of whitening products and procedures available to help you improve the look of yours. According to the Florida Dental Association, the term "bleaching" is permitted to be used when the teeth can be whitened beyond their natural color. This applies strictly to products that contain bleach – typically hydrogen peroxide or carbamide peroxide. The term "whitening," on the other hand, refers to restoring a tooth's surface color by removing dirt, stain, and debris. So any product that cleans teeth’s surface like toothpaste is considered a whitener. Of course, the term whitening sounds better than bleaching, so it is more frequently used – even when describing products that contain bleach. As of 2019, In-office teeth whitening cost $450-650 for two-three hour visit (on average) nationwide. In one short and convenient appointment, you can have white teeth that will make you feel and look great. Professional teeth whitening service in our plantation dental office is done by using a potent bleaching agent. The bleaching gel contains a much higher concentration of peroxide than found in over the counter whitening gels. Significant teeth color change with the help of a special laser light in a short period of time is the major benefit of in-office teeth whitening. This protocol involves the carefully controlled use of a relatively high-concentration peroxide bleaching gel, applied to the teeth by the dentist’s assistance. During the procedure, a bleaching agent is applied to the teeth while a protective gel protects the gums from chemical exposure. Often times, a laser is used to activate the bleaching gel and further accentuates the brightness of the teeth. Not only does this procedure make your teeth whiter than other methods, it will also last longer. Generally, the peroxide remains on the teeth for about 15 to 20-minute intervals that add up to an hour at most. Those patients with particularly stubborn staining teeth may be advised to return for one or more additional teeth bleaching sessions or may be asked to continue with a home-use teeth whitening system. The two most common in-office whitening system used is the ZOOM and The LUMIBRITE. Many cosmetic dentists have the opinion that professionally dispensed take-home whitening kits can produce the best results over the long term. Take-home kits incorporate an easy-to-use custom made kits. The gel is applied to the teeth using custom-made bleaching trays that resemble mouthguards. These products contain peroxide(s) which actually bleach the tooth enamel. Carbamide peroxide is the bleaching agent and comes in several different concentrations (10%, 16%, and 22%). Peroxide-containing whiteners typically come in a gel and are placed in a mouthguard. Usage regimens vary. Some products are used twice a day for 2 weeks, while others are intended for overnight use for 1-2 weeks. If you obtain the teeth bleaching solution from your dentist's office, they can make a custom-fitted tray for you that will fit your teeth precisely. As of 2019, take-home teeth whitening kit cost about $250 to $400 nationwide. A whiter, brighter smile is beautiful - it can help you feel better about yourself and make a memorable impression. Extensive research and clinical studies indicate that whitening teeth under the supervision of a dentist are safe. In fact, many dentists consider whitening the safest cosmetic dental procedure available. A child's baby teeth are generally whiter than the adult teeth that follow. As a person ages, the adult teeth often become stained with foodstuff, tea, coffee, red wine, and tobacco. As with any tooth whitening product, it is not recommended for children under 13 years of age and pregnant or lactating women. Oxidizing gel such as carbamide peroxide and hydrogen peroxide are used to lighten the shade of the tooth. The gel penetrates the porosities of outer teeth surface called enamel and oxidizes stain deposits. Laser bleaching uses light energy to accelerate the process of bleaching in a dental office. The effects of teeth bleaching can last for several months but may vary depending on the lifestyle and diet of the patient. Factors that decrease whitening include smoking and the ingestion of dark-colored liquids like coffee, tea, cola and red wine. There are two main methods of gel bleaching: one performed with high-concentration bleaching gel, and another with low-concentration bleaching gel. High-concentration bleaching method is performed at a dental office and moderates to low concentration bleaching gel method is available from over the counter. Performing the high-concentration method also called “take-home teeth whitening” at home is accomplished using prescribed high-concentration carbamide peroxide. This method is performed by applying a high concentration of oxidizing gel to the teeth with thin plastic trays for a short period of time, which produces quick results. The application trays ideally should be custom made to retain the bleaching gel, ensuring even and full tooth exposure to the gel. Custom made bleaching trays will typically stay on the teeth for about 20 – 30 minutes. Trays are then removed and the procedure is repeated up to two more times that day. The gel is usually carbamide peroxide, which breaks down in the mouth to form hydrogen peroxide. The gel typically contains between 15% and 44% carbamide peroxide. Low-concentration over the counter whitening is far less effective. Low-concentration whitening mostly involves purchasing a thin mouthguard or strip that holds a relatively low concentration of oxidizing gel next to the teeth for as long as several hours a day for a period of 14 days. Results can vary, depending on which application is chosen, with some people achieving whiter teeth in several weeks, and others seeing very little results or no results at all. Occasionally, dentists, as well as some dental laboratories, can fabricate custom-made whitening trays that will greatly improve the results achieved with an over-the-counter method. A typical course of teeth whitening can produce dramatic improvements in the cosmetic appearance of most stained teeth; however, few stains respond poorly to whitening. Tetracycline staining may require prolonged exposure to the gel. Teeth white-spot decalcifications may also be highlighted and become more noticeable directly following a teeth whitening process, but usually calm back down with the other parts of the teeth becoming whiter. Teeth white spots become less noticeable, with the other parts of the teeth becoming whiter. Teeth whitening is not recommended if teeth have decay or infected gums. It is also least effective when the original tooth color is grayish and may require custom take-home trays. Teeth whitening is most effective with yellow discolored teeth. However, teeth bleaching gel neither works where bonding has been used nor is it effective on the tooth-color filling. Other options to deal with such cases are the porcelain veneers or dental bonding. Although there is a wide range of whitening products and techniques available, the results after using them may vary from very positive results to almost non-existent results. Treatment times and recommendations are dependent on the condition of a person’s teeth at the time of treatment. The American Dental Association or ADA recommends having one's teeth checked by a dentist before undergoing any whitening method. The dentist ideally should clean the outer teeth surface called enamel; otherwise bleaching gel would not penetrate enough into the enamel to remove stain deposits. The dentist also should examine the patient thoroughly and check for possible teeth enamel irregularities. According to the American Dental Association or ADA, there are different options for whitening one's teeth. They all rely on varying concentrations of whitening agents. The ZOOM whitening system in Plantation. The procedure is simple but requires a trained dentist or clinician to administer. It begins with a preparation to cover your lips and gums, leaving only your teeth exposed. The Zoom dentist or trained clinician then applies the Zoom gel. The Zoom light is then pointed at the teeth surface with gel on them. The light and gel work together to gently penetrate your teeth, breaking up the stains and discoloration. The whitening gel is applied for 3 to 15-minute sessions for a total treatment time of about 60 minutes. Zoom can whiten teeth up to 8 shades in ideal situations. The Zoom! Light-activated whitening gel's active ingredient is Hydrogen Peroxide. The LUMIBRITE Chairside Whitening System uses 35% hydrogen peroxide gel and is ideal for fast, effective and gentle whitening with minimal to zero sensitivity. This whitening system contains fluoride for an even healthier smile. LUMIBRITE Desensitizing Gel shields against whitening sensitivity. You’ve also got the choice of whitening without the light and still getting great results. The cheapest and most convenient of the teeth whitening options, over-the-counter bleaching involves the use of a store-bought whitening kit, featuring a bleaching gel with a concentration much lower than that of the professionally dispensed take-home whiteners and in-office whitening systems. 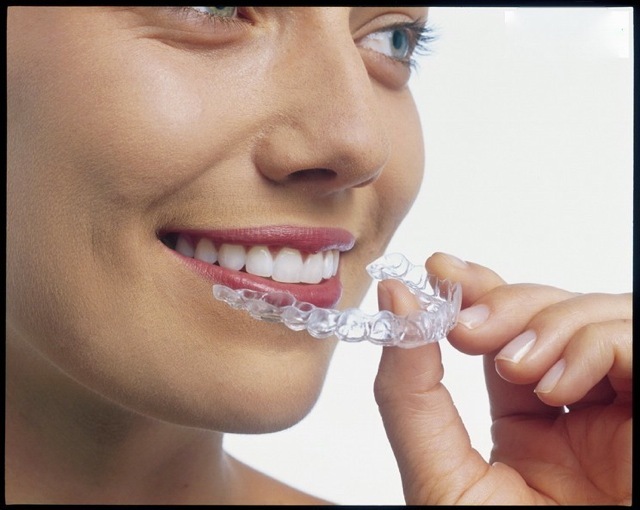 The gel is applied to the teeth via one-size-fits-all trays, whitening strips or paint-on applicators. In many cases, this may only whiten a few of the front teeth, unlike custom trays that can whiten the entire smile. The American Dental Association has published a list of accepted over-the-counter whitening products to help people choose appropriate whitening products. We are a private dental practice in Plantation, Florida. Our patients are people from all walks of life and all different socio-economic levels who value personal care and attention to details. Our professional whitening systems prices are based on the high quality of service, materials, and laboratories used on each individual whitening case as well as on individualized needs of each patient. While there are several kinds of whitening treatments yet, not all of them are as equally effective. Over the counter gels and bleaching kits are generally more affordable, yet the results are often less than desirable. Personal do-it-yourself methods can leave stains and the results do not last without continued use. For optimum results, dental professional services can suffice. To keep your teeth looking their best, we recommend flossing, brushing twice daily, and occasional touch-ups. These touch-ups are professional formula products designed specifically to keep your teeth their brightest. They are available through our dentists in Plantation, Florida. Schedule a dental appointment with our dentists in Plantation to learn whether whitening procedures would be effective for you. Whiteners do not correct all types of discoloration. For example, yellowish teeth will probably bleach well, brownish teeth may bleach less well, and grayish teeth may not bleach well at all. Likewise, whitening may not enhance your smile if you have had tooth-colored fillings or crowns. The whitener will not affect the color of these materials and they will stand out in your newly whitened smile. In these cases, you do have other options, such as porcelain veneers. When selecting a whitener or any dental product, be sure to look for the American Dental Association Seal of Acceptance — your assurance that a product has met American Dental Association standards of safety and effectiveness. Teeth whitening strips are thin, flexible plastic (polyethylene) strips with a thin film of hydrogen peroxide bleaching on one side. Whitening strip kits come in two types of strips: strips for the upper teeth and strips for the lower teeth. Our staff in Plantation recommend that the bleaching agent is applied by placing the strips across your teeth and gently pressing the strips into place to ensure contact with all your teeth. the strips are typically worn for 30 minutes a day, twice a day. The duration of treatment will vary. Paint-on teeth whitening allows you to apply the gel directly to your teeth without an appliance or strip. You simply "paint" the whitener onto the surface of clean, dry teeth and wait about 30 minutes while the paint turns to a dry film. To remove this film, you simply brush your teeth with a toothbrush. Paint-on whitening products require twice-daily applications to be effective. The duration of treatment will vary. An advantage of this process is that you can selectively paint individual teeth. Teeth whitening can have minor side-effects and you should speak with your dentist if these become bothersome. For example, teeth can become sensitive during the period when you are using the bleaching solution. In most cases in our plantation dental office, this sensitivity is temporary and should lessen once the treatment is finished. Some people also experience soft tissue irritation, either from a tray that doesn't fit properly or from a solution that may come in contact with the tissues. The American Dental Association or ADA has consumer information answers to tooth whitening dental related questions. 2014 teeth whitening study: 58% of people more likely to be hired after tooth whitening. In December 2014 on its website, Valet Magazin (12/17) reports that good teeth are what women “judge men on most” when first considering a romantic relationship, while independent research firm Kelton Research “found that 58% of a study’s participants were more likely to be hired and 53% received larger salary offers after their teeth had been whitened.” Citing the advice of dentists, the article goes on to advise on methods to whiten teeth, including visiting the dentist for a professional whitening treatment.